If you're looking for a DEET-free insect repellent that's suitable for babies and young children, try this! 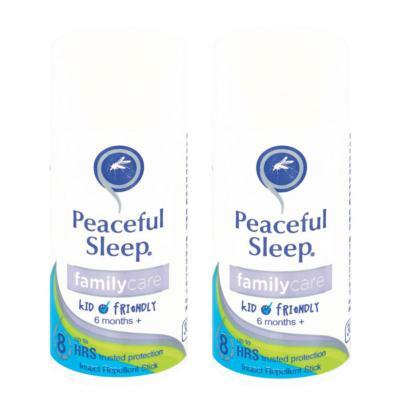 Peaceful Sleep Family Care Insect Repellent Stick 30g is scientifically formulated to protect the entire family, including children as young as 6 months, from mosquitoes, fleas, flies and ticks for up to 8 hours. Simply smooth directly on the skin for maximum protection. Containing effective, DEET-free ingredients as well as natural plant-based oils such as lemongrass and citronella, the stick does not leave a sticky residue, which makes it perfect for sensitive skin and is suitable for babies from 6 months and young children. It works hard to prevent painful and irritating bites and is an ideal solution if you're looking for a repellent that doesn't contain DEET but actually works. Available as a pack of two sticks, we also offer a Peaceful Sleep Twin Pack containing DEET and a twin pack containing one DEET stick and one non-DEET stick, offering great choice for you and your family.